Cool bird names can sell a lot of cars! Birds can be sleek, aerodynamic, and powerful — all in one package. Automakers picked up on this early: a cool bird name will sell cars. 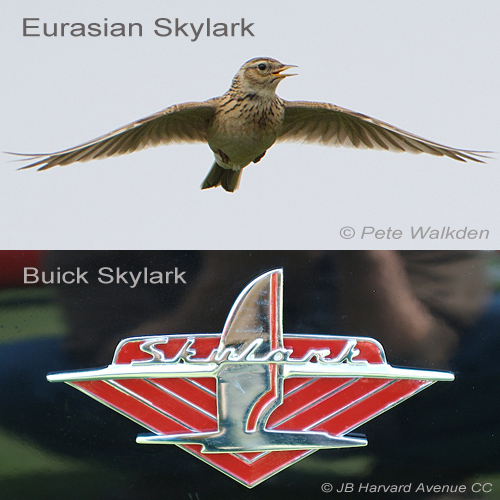 So far, more than twenty models of cars have been named for birds — some real, some mythical — and they go way back. Ford Thunderbirds, Buick Skylarks, Plymouth Roadrunners, AMC Eagles, and more... How many can you name? Birds can be sleek, aerodynamic, and powerful – all in one package. Automakers picked up on this early: a cool bird name will sell cars. So far, more than twenty models of cars have been named for birds—some real, some mythical — and they go way back. In 1928, you could buy a Stutz Blackhawk. The following year, a Kissel White Eagle. All through the 1960s, Ford Falcons glided over the roadways, dodging Thunderbirds, Buick Skylarks, Plymouth Roadrunners, and AMC Eagles. Did you know the Toyota Tercel [tur-SELL] shares the name of a male falcon, a tercel [TUR-suhl]? And then there was the Pontiac Sunbird — a name shared with lovely, real birds in Africa and Asia. Bird-named cars peaked in the ‘60s and ‘70s, with Pontiac Firebirds and Jeep Golden Eagles.